Fig. 6. Estimate of quantitative evolution of control variables for seven planetary boundaries from pre-industrial levels to the present (see Appendix 1, Supplementary Methods 2 for details). The inner (green) shaded nonagon represents the safe operating space with proposed boundary levels at its outer contour. The extent of the wedges for each boundary shows the estimate of current position of the control variable (see Table 2). Points show the estimated recent time trajectory (1950–present) of each control variable. For biodiversity loss, the estimated current boundary level of >100 extinctions per million species-years exceeds the space available in the figure. 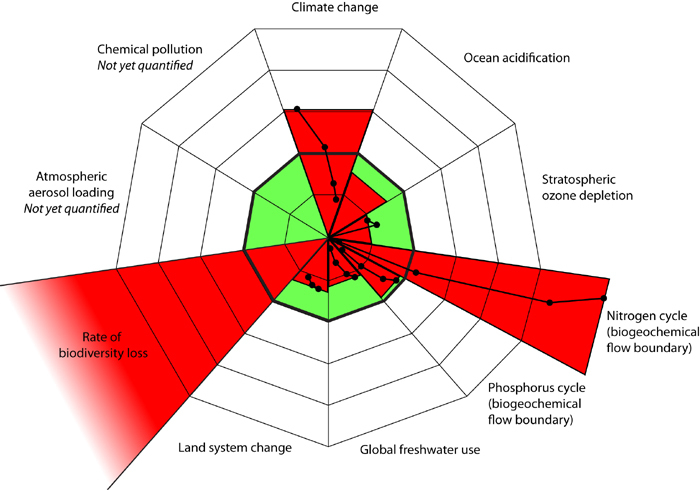 Although climate change, ocean acidification, stratospheric ozone depletion, land-use change, freshwater use, and interference with the phosphorus cycle are boundaries defined as the state of a variable (concentration of atmospheric CO2, aragonite saturation state, and stratospheric ozone concentration, percentage of land under crops, maximum amount of global annual freshwater use, cumulative P loading in oceans, respectively), the remaining boundary, biodiversity loss, and the component of the biogeochemical boundary related to the human interference with the N cycle are defined by rates of change for each respective control variable (extinctions per million species per year, rate of N2 removed from atmosphere for human use).